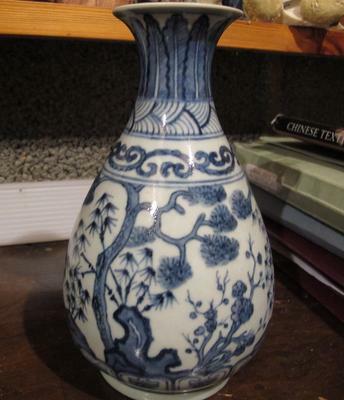 Here is a vase with a ming reign mark. I am not sure whether this vase is new or not - the footring has orange burn marks from firing (between the glazed and unglazed areas) which I thought was a sign of some age. I would be very grateful for your opinion. thanks very much peter for your comments. I will investigate further. 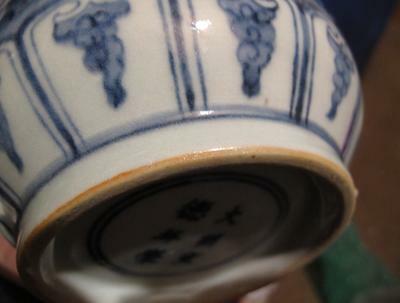 The bottom does not look quite right for Ming, the same is valid for the blue color and glaze. 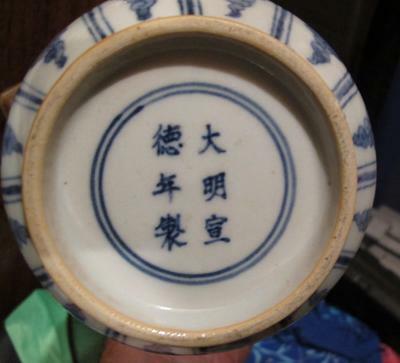 Cannot tell if it could be Qing, but the color of the foot rim is a bit too obvious. The orange color should not cover the whole unglazed rim. It would be a fine line along the glaze edge that is orange. This way it looks as if an iron wash was used to produce the effect. In the second picture it looks as if the rim was covered with transparent glaze. If that is the case, I see a problem.